We are in a culture where the term “all natural” gets tossed around quite a bit, but what does that mean? It is supposed to mean that all of the elements used to create the product have been derived from nature. But what if you don’t want everything that nature has to offer? Along with beautiful botanicals, plant oils, and essential oils, nature gives us bacteria (the featured image), mold, fungus, viruses and all other nasties. This is part of nature. As Bath, Body, and Candle Moments prepares for its reopening, we have been evaluating our formulas, especially for our scrubs. There is a debate about concentrated (which means all oil-based; or made without water) formulas. It’s true that bacteria and mold are unhappy in a concentrated environment, and usually won’t grow in such conditions, but what about people who leave their scrubs in the shower? Or who use their wet hands to scoop out the scrub? Bacteria and mold LOVE water, and they thrive in this environment, so we started thinking…maybe it would be the safest option to include a preservative in our scrubs, so people can rest-assured that the nasties-of-nature won’t be growing in their luxurious scrub. After all, who wants to wash his/her face with mold and bacteria? Count me out! So we have decided that Optiphen would be the best solution to preserve our scrubs. Optiphen, in particular, is a paraben and formaldehyde-free preservative that is necessary to prevent the growth of bacteria, mold, and other nasties in the scrub. Without it, it’ll only be a short amount of time before horrible things start growing. It’s better to have .5% (such a small amount!) of a preservative in a scrub rather than a lot more of something gross rubbed all over your skin. Optiphen is comprised of Phenoxyethanol and Caprylyl Glycol. You may find a lot of half-hearted science on the web explaining that Phenoxyethanol is dangerous, but if you read closely, this is usually used in amounts of full strength or high-dose exposures, not nearly anywhere the recommended usage of 1% (and we only use .5% in our formulation!). It’s all about the final formulation. Think of it like a cupcake recipe. You wouldn’t want to eat a mouthful of salt, or raw egg, or flour, or probably any other ingredient that goes into a cupcake. (Not only would it taste disgusting, eating a bunch of salt or raw eggs could make you sick!) But mixed in just the right amounts, baked just the right way, a cupcake is divine. That’s the magic of chemistry! Product formulations work the same way. As for Caprylyl Glycol: Glycols are known to be antimicrobial and show antimicrobial efficacy against typical germs found in cosmetic formulations. It’s a mild humectant and skin emollient with a unique skin feel and also improves efficacy of traditional cosmetic preservatives, which means, it helps make the Phenoxyethanol more effective and leaves the skin feeling soft, supple, and hydrated. Interested in a little more information? We always buy our Optiphen from Brambleberry, which is hailed as one of the most reputable suppliers in the United States. Anne-Marie Faiola, the Soap Queen, talks more about preservatives in her Talk-it-Out-Tuesday blog. We understand the concern over “preservative free” and “all natural,” but as much as we love nature (which is why we’re a strictly vegan company), we also understand that above all, consumer safety is our number one priority. Nature is great, but with a little help from science, it’s perfect. Bath Fizzies are extremely popular these days. They provide fun, fragrance, and skin-loving moisture to the traditional bath. The great thing about Bath Fizzies are that they can be customized to fit your favorite style and scents. When Bath, Body, and Candle Moments re-opens, we will be selling fun and fragrant Bath Fizzies on our site, but if you can’t wait and you want a Fizzie right now, we’ll share a recipe with you! Get All Of Your Supplies Here! 1. Measure out sodium bicarbonate and take out all clumps with fingers/whisk in a large bowl. The mixture should be nice and smooth! 2. Add coconut oil, essential oil, and cream of tartar into the mix. Work in all the liquids using fingers and whisk. 3. Check texture by squeezing mixture in hands. If it sticks together naturally, perfect. If it crumbles, spray with witch hazel to create a lightly wet-sand consistency. 4. Add citric acid. Work into mixture so there is a full coating. 5. Separate into three equal parts, color one part red, one part blue, leave one part. 6. Pack colors into two shells however you choose. Don’t pack too tightly, but be sure to slightly overfill each side. 7. Squeeze both parts together, and wipe the sides to remove any excess. 7. Separate by gently tapping all sides with a spoon and gently twisting. 8. Let harden for about 24 – 48 hours, enjoy! We’re Closing – But Not for Long! Thank you for taking our survey; we now have a much better idea of the direction and vision for our brand. For example, our new logo, which best reflects how our heart and soul are candles, but we’re also so much more. We just wanted to let you know that we will be closing the shop for new branding and renovations from January 25th – February 21st. But we’ll be back and better than ever! Follow us on Facebook, Twitter, or Instagram to stay posted as we continue to bring you new and amazing products! To prepare for our new re-launch, we want you to take 30% off anything we currently have in stock! Just use code RENOVATE30 at check-out to take 30% off your entire order. This coupon is good until January 24th. When we come back, we’ll send you an email, but we highly encourage you to follow us on social media, as we’ll be quite active there. Any questions or concerns? Please email us at thecandlemoments@gmail.com. It’s 2016 and it’s time for some significant changes at Candle Moments! We have had a successful opening, and now we understand our vision a little better, but we need your help. Before we jump in and start making huge changes to our product offerings, and even our logo, we absolutely need your opinion. Please take 3 minutes to complete the survey, and as gratitude for your time, we will offer you a unique discount code! I had the distinct pleasure of working with Angela Carillo of Alegna Soap yesterday as she taught me how to create cold process soap-making. Cold-process soap is the art and science of saponification. In short, saponification is the process of lye (or sodium hydroxide) reacting with triglycerides (fats) to create soap. The saponification process happens when lye water meets with the fats and begins to emulsify. The process appears to happen after a great deal of mixing, but it really takes up to 48 hours, in which case the soap goes through a “gel” phase. After this phase, the soap is able to be cut, but then must be dried between 4-6 weeks as the water is evaporated, creating a hard bar of soap. As Candle Moments continues it process of rebranding and change during the course of 2016, we will, in some time, begin to offer cold-process bars of soap. For now, as I practice and learn, we will continue to offer hot-process soap. Why are we interested in cold-process soap? We want to be able to offer our customers vegan, chemical-free, cruelty-free soap. As you know, our vision and premise is already on clean, renewable resources, while protecting all of Earth’s creatures. The chance to shower with true cold-process soap is a simple luxury, one we could all afford, but more so, one our body and Earth deserves. As with our candles, if you wouldn’t eat it, you shouldn’t breathe it or bathe in it. Aside from being a kind, patient, and knowledgeable instructor, Angela shared recipes and gave us the opportunity to get our hands dirty and make our own soap. She answered all of our questions, gave us tips, advice, and went above and beyond any expectations. If you are ever in the Bethpage area of Long Island, I highly recommend her class! Visit her website for class scheduling. This picture (taken by Angela), is of me mixing the lye water with the selected oils. For this particular soap batch, we used Olive Oil for moisture, Coconut Oil for bubbles, and sustainable Palm Oil for hardness. We used Lavender and Rosemary essential oils to create a deliciously clean and refreshing scent. Lemon Essential Oil is a must for every household! It’s useful for a wide range of purposes, it smells brilliantly crisp and vibrant, and it’s one of the most economical aromatherapy oils available. Lemon oil comes from the cold expression of fresh lemon peels and smells fresh, with the pungency and brightness expected of citrus. Some of lemon oil’s many properties include: antimicrobial, antiseptic, astringent, diuretic, insecticidal and tonic. Lemon essential oil is derived from the fruit of the lemon tree. The tree is believed to be a native of China, arriving in Europe by way of Persia. Later, Christopher Columbus brought the lemon seeds with him to Hispaniola (now Haiti/Dominican Republic). Today, lemon oil is mainly cultivated in California and southern Europe. It takes about one ton of fresh lemons to yield six or seven pounds of lemon essential oil! Because of its antimicrobial properties, lemon is one of the most important oils for supporting the immune system. Diffuse lemon into the air for treatment and prevention of colds, coughs and other respiratory problems. You can also use lemon oil for facial toning and cleaning; its astringent qualities can be helpful for acne and excessive oiliness. Try out our Sunrise Lemon Burst Scrubby Body Polishing Oil which is fused with wonderful lemon essential oil. Emotionally, lemon has a cheerful, positive aroma and energy, and can help lift a sluggish or negative state of mind. It can also help with focus and concentration. A study done in Japan showed that diffusing lemon oil with rosemary oil increased cognitive awareness for a group of Alzheimer’s patients. Try adding a few drops to a wax warmer with a carrier oil when learning new material or studying for an exam. Lemon oil is also a fantastic addition to household cleansers and sprays. Add a drop or two to your dish soap or general cleanser to brighten countertops, floors and bathrooms. To combat mold and mildew, try adding four drops of lemon oil, three drops cinnamon oil and three drops tea tree oil to two cups white vinegar and spray onto affected areas. Cautions: While lemon essential oil is considered safe and non-toxic, it is important to use it appropriately. 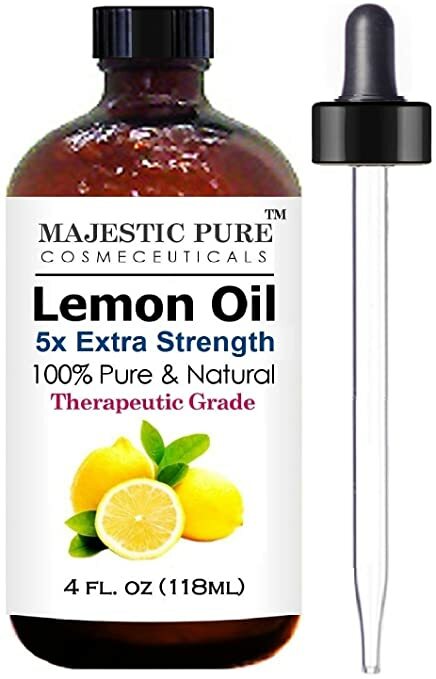 As with most essential oils, lemon should be diluted before use on the skin. As a general rule of thumb, add five drops or less of lemon oil per teaspoon of carrier oil. Lemon is a photosensitizing agent, meaning it can increase the skin’s sensitivity to ultraviolet light. Do not use on the skin or in a bath for 12 hours prior to sun or sunlamp exposure. Stay tuned as we prepare to roll-out our aromatherapy line of products! We completely understand that we are nothing without the loyalty of our customers; we cherish this relationship above all else with regards to our company. Because of our commitment to customer satisfaction, we have made a Customer-Service-Code-of-Honor that we promise to uphold. Patience. We believe it’s extraordinarily important to take our time answering any and all of your questions, and addressing all of your concerns. Especially as a small business, we believe quality service beats fast service in every circumstance. Attentiveness. We are listening! Whether you’re writing us a direct email, giving us a call, liking and commenting on our Facebook page, giving us awesome hearts on Instagram, we are listening! We are always paying attention to what you need and want. Return policy. We offer a 14 day return policy. We believe in our products and stand by their quality, but we understand that sometimes things don’t work out. We understand that building trust includes giving you the confidence to return. Product knowledge. We personally hand-craft everything we sell (except for our candle snuffers), so we know exactly what goes into each product. We study, test (never on animals), and only choose the absolute highest quality ingredients on the market. We provide as much information as we possibly can our our website to guide you through every aspect of our business, include a FAQ, a candle care guide, and clearly listed ingredients. If you have questions, we are transparent and will happily answer anything you want to know about our products. Feedback. Because trust is only built on honesty and transparency, we always follow-up with our customers asking for feedback. You can find reviews of our company on Facebook, on our Testimonials page, and directly on our product pages. Friendly and Courteous. Absolutely everyone deserves to be treated with courtesy and respect! We would love to hear more about your expectations for quality customer service. What makes a company extraordinary over ordinary?